Acrocanthosaurus atokensis, a large carcharodontosaurid theropod, is known from several specimens collected in the 1990s, as well as the two original specimens collected in the 1940s. The holotype, OMNH 10146, contains a well-preserved and complete braincase that was scanned at the High Resolution X-ray Computed Tomography (CT) Facility at The University of Texas at Austin. The resulting images were manipulated using graphics and volume rendering programs to produce a complete digital endocast of the endocranial cavity. The images reveal all of the cranial nerves except for the vestibulocochlear nerve. Also visible are: (1) the pituitary fossa; (2) the fenestra ovalis; (3) the entrance of the internal carotid arteries; (4) all three semicircular canals; and (5) several smaller arteries and veins. This complete endocast allows for: (1) the description of the previously undescribed endocranial cavity of Acrocanthosaurus; (2) determination of skull orientation using the semicircular canals; and (3) comparisons with closely related taxa such as Carcharodontosaurus, Giganotosaurus, Allosaurus, and Sinraptor. 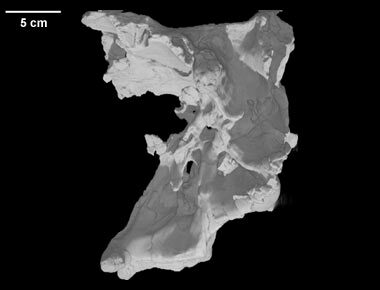 The comparisons can consist not only of characters that can be seen in the braincase and endocast, but also of quantitative, volumetric measurements that are available through the volume rendering program used to create the endocast. These comparisons uphold the proposed relationships of Acrocanthosaurus being within the clade Carcharodontosauridae and the sister taxon to Carcharodontosaurus, and allow for new characters to be applied to the data matrices used to determine the relationships. See 'Additional Imagery' for endocast animations. This specimen, the holotype, was collected in 1941 by Works Projects Administration (WPA) crews under the direction of Professor John Willis Stovall, University of Oklahoma Department of Geology. It was made available for scanning by Dr. Wann Langston and Dr. Timothy Rowe of The University of Texas at Austin. This specimen was scanned by Richard Ketcham and Matthew Colbert on 12 January 1999 along the coronal axis for a total of 342 slices. Each 512x512 pixel slice is 1.0 mm thick, with an interslice spacing of 0.8 mm (resulting in a slice overlap of 0.2 mm) and a field of reconstruction of 225 mm. 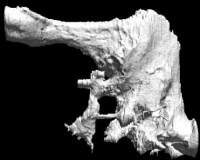 To cite this page: Dr. Jonathan Franzosa, Dr. Timothy Rowe, 2008, "Acrocanthosaurus atokensis" (On-line), Digital Morphology. Accessed April 25, 2019 at http://digimorph.org/specimens/Acrocanthosaurus_atokensis/.